Pixels you can walk on « pixels …everywhere. 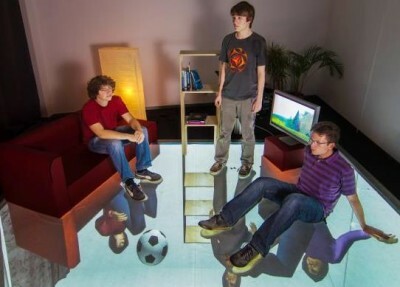 However, some researchers at the Hasso Plattner Institute in Germany think floors are perfectly good places for pixels. They’ve demonstrated an interactive floor project called GravitySpace, targeted at gaming and pictured here. Intel even featured GravitySpace recently in their IQ by Intel blog. If you check out the GravitySpace site, you’ll immediately think of many, many, digital out-of-home applications. But, of course, you could use those pixels for other purposes, too, not just for showing mirror images (as cool as that is). Wayfinding is the most obvious. But also imagine walking from one area of a store to another where the floor could direct you to items on sale or to items related to something you already bought. How close are they to using ‘perfect pixel’ sizes, you ask? The GravitySpace prototype is 8 sq. 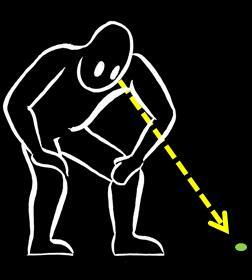 metres and according to data on their website, has 12 megapixels. I’m guessing that they use 3 blended HD projectors, but it’s not clear. That implies that their pixels are in the range of 0.8 to 1 mm – a bit larger than the perfect size of 0.44 mm for floor pixels viewed by an average height North American female. Not perfect pixels, but not too shabby. Installing a projector under a floor presents a few problems, though. 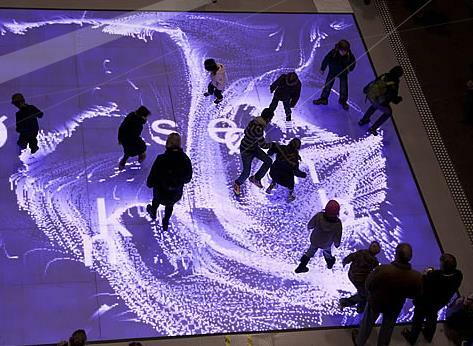 Note that this isn’t the first time people have experimented with interactive floors. In 2008, Phase7) installed ‘ØNSKEBRØNN’ in Sandnes Norway and in 2010 they showed it again at a Berlin train station (shown above). It used wide-pitch LEDs, so the pixels were far larger than ‘perfect’ sized ones. Nevertheless, it does look like an amazing experience, though.